This bear shock electric fence is 1 foot higher than the original and contains eight 4ft posts to cover a 45ft x 45 ft area. The 4ft Posts are great for the Alaska tundra and also for use as a horse corral or for air planes. Please shop our products below and feel free to contact us is you have any questions. Thank you. Sleeping in bear country can be very frightening for people. 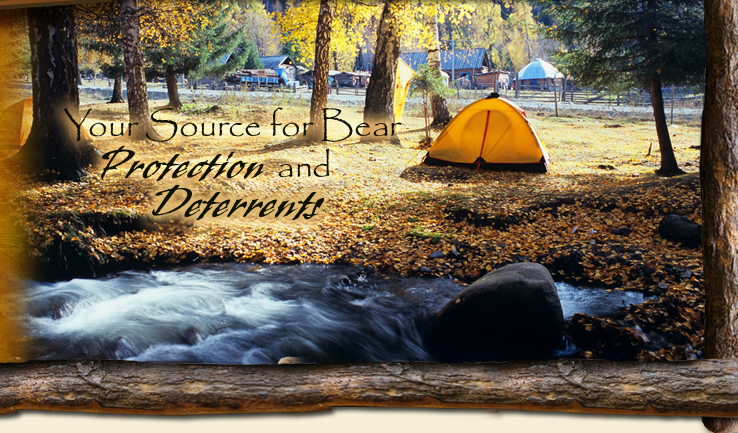 This new item is an answer to the problem of fear while camping in bear country. This is useful for everyone sleeping in the backcountry. 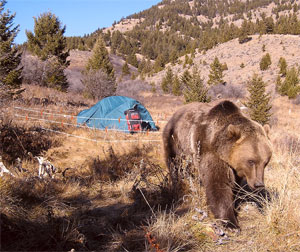 Bear specialists and outdoor professionals will tell you, bears who willfully enter a camp are either predatory or have become used to eating garbage and human food. 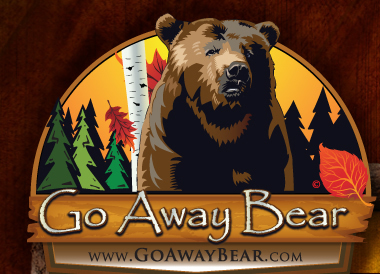 Either way these bears are no longer fearful of being in close proximity to humans and are very dangerous. Bear Shock is a lightweight battery-powered, electric fence system and is designed to provide safety and sound sleep while in bear country and to help protect you and your equipment from curious bears by providing a surprising electrical shock if touched. Bear Shock uses 3 poly-wires with one hot and one ground. When the energizer is turned on, Bear Shock will distribute an electric charge of about 6,000 volts if touched. Have a good night's sleep while sleeping in bear country. Bear Shock weighs 5.9 lbs. with batteries, and fits in a 8"x 25 storage bag. Bear Shock will enclose a 45t. x 45t. area, and runs on 2 D-cell batteries that can supply power to the energizer continuously for approximately five weeks. Bear Shock can easily adapt to most environments. There is enough poly wire to fence an area 45ft. by 45ft. It is fully adjustable and has three gate hooks for easy access. A much smaller area can be fenced by cutting the poly wire. The poly wire can later be tied back together if a larger area is preferred. Bear Shock is lightweight, portable, and simple to use with all the components included in one easy kit. Bear Shock helps provide safety and peace of mind for you and your family while enjoying the outdoors. 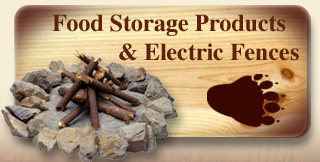 Bear Shock is not approved for food storage in the lower 48 states. 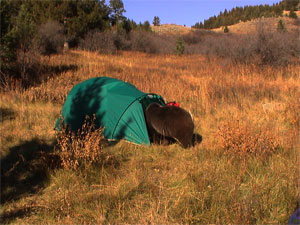 Bear entering camping tent, unafraid and curious. "No Bear Shock Electric Fence!" Ultra Light Electric Camp Fence.